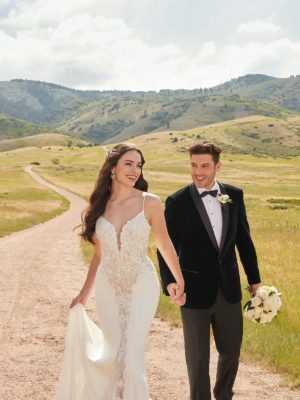 Crêpe fit and flare wedding gown with collared halter neckline, fabric button closer at back of neck and low, open back, finished off with a beaded applique belt. Soft a-line organza wedding gown with spaghetti straps and French Alençon lace beaded bodice. Classic A-line wedding gown with structured bodice featuring a slight plunge and adorned by striking floral blooms. The neckline extends off-the-shoulder into draped sleeves. A-line wedding gown with sheer bodice adorned by rich lace and highlighted with a V-front and V-back. From the waist, silk zibeline extends to the ground featuring slight pleats and pockets. 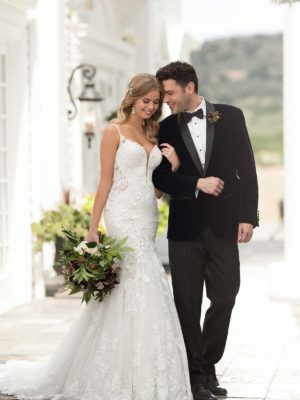 Fit and flare crepe wedding gown with sheer bodice, textured lace appliqués, v neckline, sheer back and dramatic tulle train. 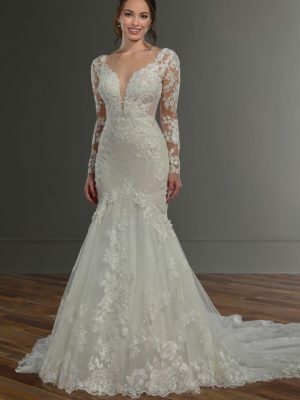 Fit and flare lace wedding gown with plunging V neckline surrounded by strategically placed lace appliqués to flatter the body and finished off with a stunningly scalloped train. Strapless sweetheart neckline lace fit and flare gown with romantic off shoulder straps and gorgeous floral lace appliqués. 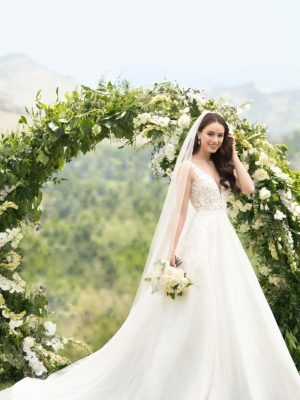 Long sleeved fit and flare wedding gown with a deep V-neckline, sheer lace cutouts and a beautifully detailed train. 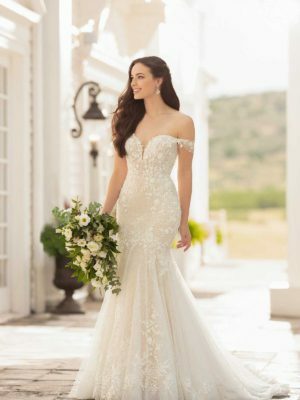 Illusion off shoulder fit and flare wedding gown with gorgeous floral lace appliqué and dramatically detailed train. 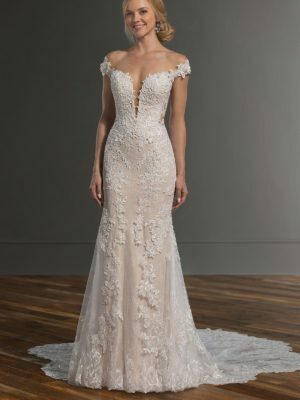 The fitted lace bodice of this fit-and-flare gown features a V-neckline and beaded shoestring straps, and is highlighted with hand-beaded, 3D flowers that change in scale as they cascade down the gown. From just below the hips, the skirt becomes very full, allowing the sequin-embellished French lace to shimmer beautifully. The gown’s V-back with sheer detailing adds a flirty element to the style, while the dramatic lace train with appliques completes the look. Lace detailing extends from the V-neckline of the gown’s bodice and continues down the front of the dress, creating a cutout effect. The same lace cutout on the front of the skirt is repeated at the back of the skirt, extending into a full, scalloped edged train. Beaded shoestring straps extend from the neckline to the back of the gown creating a V-back, highlighting with illusion tulle and lace. A-line wedding gown with blush shimmer layer, skirt slit, adorned cap sleeves an a deep-v illusion neckline.